World leader in advanced technology flooring for dance, Harlequin have been designing, manufacturing and installing a range of long-lasting, durable portable and permanent sprung floors and vinyl floors for dance, theatre and the performing arts industries for over 40 years. Harlequin has led the way in developing and evolving the modern dance floor and has been involved with extensive research into reducing dancer injury, whilst placing trust and innovation at the heart of everything it does to become a brand that dancers and performers depend on. With a growing interest in the provision of spaces suitable for dance, for professional performance and rehearsal, private dance schools and throughout the education sector, there is increasing focus towards specifying dance floors that meet both performance aspirations as well as conforming to health and safety requirements. Harlequin have extensive experience working on projects with architects and main contractors at leading venues around the world. All Harlequin products are listed on the NBS National BIM Library to enable simple specification, relevant links can be found below. 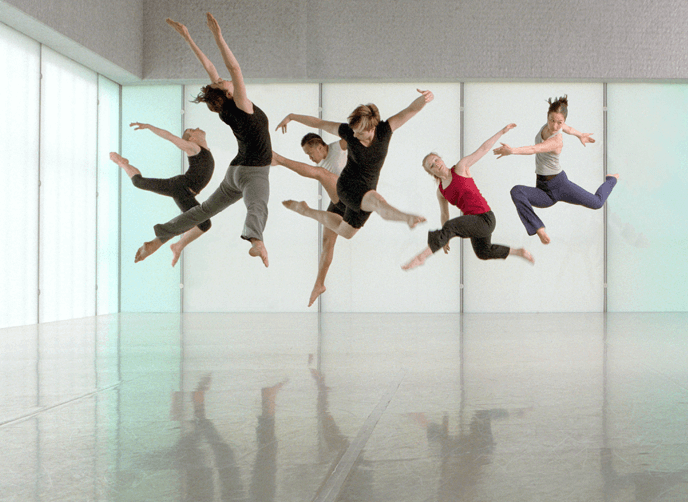 It is a common assumption that a well-designed sports floor will suit the needs of dancers, but this is not the case. Sprung floors for sport are tested for adequate ball bounce and athletes require a high degree of energy return or ‘spring’. Dancers have little interest in ball bounce and require a combination of shock absorption and energy return. For a dancer, the quality and consistency of both the sprung floor and dance surface is critical. Every dance step or jump on an unyielding surface wears down the resilience of the body and increases the risk of injury and the prospect of long-term damage. A sprung floor is designed to offer cushioning and impact reduction when landing after jumps or similar movements. Lower limb problems such as tendonitis, ‘shin splints’, knee pain and ankle strain can all be attributed to incorrectly specified sprung floors. Such injuries can have a significant bearing on the longevity of a performer’s career. 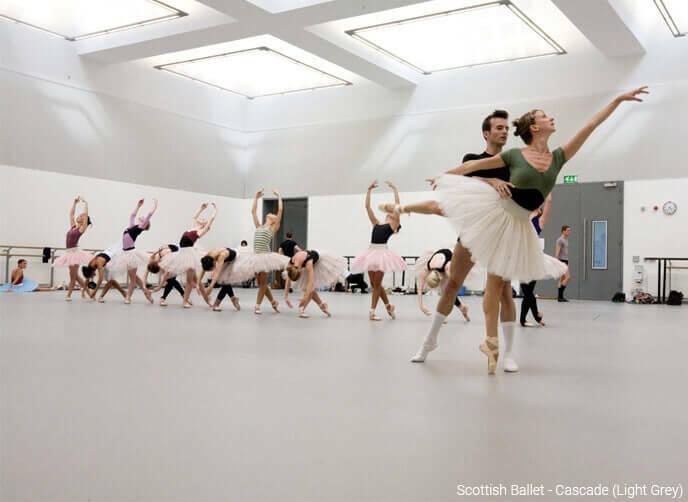 Floors developed for general industrial, commercial or sports applications do not offer the benefits that dancers appreciate when they talk about the ‘feel’ of the floor. Only floors developed for dance do that. Medical research into dance injuries supports the benefits a suitably designed sprung floor contributes towards reducing the type of injuries associated with dancing on hard, unyielding floors. The degree of spring is also critical, sufficient to absorb the impact of dancers landing from jumps, but not bouncy like a trampoline and localised so that the landing does not affect other dancers nearby. Historically, the choice of performance surface was between a wooden floor and linoleum, until the advent of purpose developed vinyl floors, pioneered by Harlequin and others, during the 1970s. Although it may be tempting to opt for a wooden floor for purely aesthetic reasons, or a commercial grade vinyl for reasons of cost, Harlequin offer many options specifically designed for dance. The main criterion for dancers in judging performance is slip-resistance, dubbed “traction” by many in the dance community. Although sports people share concern about the risk of slipping and falling, they again are generally protected by their footwear from floors that might be considered a slip hazard for dancers, for example some hard-lacquered wood floors. A well-installed hardwood sprung floor, properly finished and maintained, does look attractive and, specifically for ballroom dance, is a desirable choice. Softwood floors are rarely an option because even with a lacquered surface they are too readily susceptible to damage, gouging and splintering. However, with correct preparation and sealing, softwood floors can indeed provide a very acceptable sub-floor on which to install a Harlequin vinyl or hardwood performance surface. Currently, no standards exist which relate specifically to dance floors. Harlequin floors are fully tested in accordance with European Standard for surfaces for indoor facilities for multi-sports use, EN 14904:2006 by the Centre for Sports Technology Ltd in London. We deem this an adequate measure for sprung floors, but inadequate with regards to slip resistance of performance surfaces. The European Standard EN 14904:2006 requires tests for shock absorption, vertical deformation, area deflection and behaviour under rolling load. The ‘Force Reduction’ test measures the degree by which the floor reduces the impact force which occurs when an athlete, or dancer, lands on it. 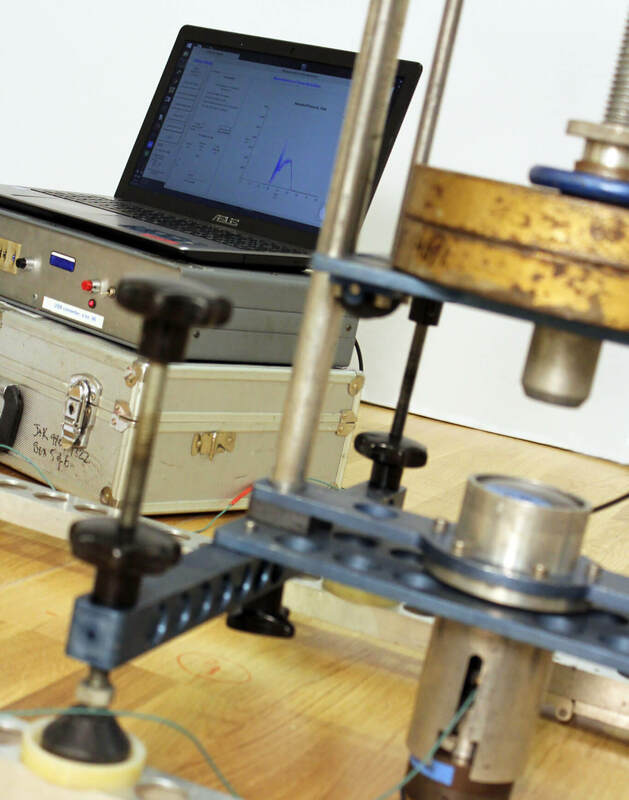 The test is carried out on a concrete floor as well as on the floor under test and the result quoted is the amount by which the force measured on the test floor is lower than the force measured on concrete. In the ‘Vertical Deflection’ test, the amount by which the floor deflects under impact load is measured directly. Area Deflection is measured using a modification of the vertical deflection apparatus. The purpose of the test is to ensure that one athlete or dancer standing on the floor will not be excessively disturbed by the movements of another nearby. The ‘Rolling Load Resistance’ test is carried out on two structurally critical areas of the floor. A steel wheel whose width, diameter and corner radii are defined, is loaded to 1500 N and is rolled repeatedly over the surface of each area. After 300 passes, the floor is examined for damage. The European Standard also tests for vertical ball behaviour (‘ball bounce’) which is irrelevant in a dance floor, and ‘Friction’ which we deem an inadequate measure of the slip-resistance required in a dance surface. The results of all tests on Harlequin floors can be found in the Specification Sheets for each product.